Say hello to Shrove Tuesday! One of my favourite days of the entire year because it's all about the sweet treat that is pancakes. Sure, some of you might be into those savoury crepes but, if you are, this isn't the blog post for you. This is all about Pancake Day and the simple pleasure that is toasty warm pancakes and tasty fillings or toppings. Let's run down some of the bad boys that I'll be trying tonight! I always like to kick off with the absolute classic. 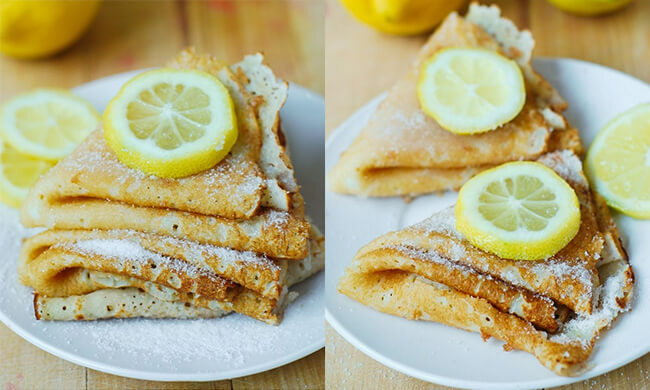 If there's something basic that's awesome, it's Lemon & Sugar Pancakes. All you need is 140g plain flour, 200ml milk, 2 eggs and some butter for greasing the frying pan. It's so easy! This recipe is the basis for all amazing crepe recipes. 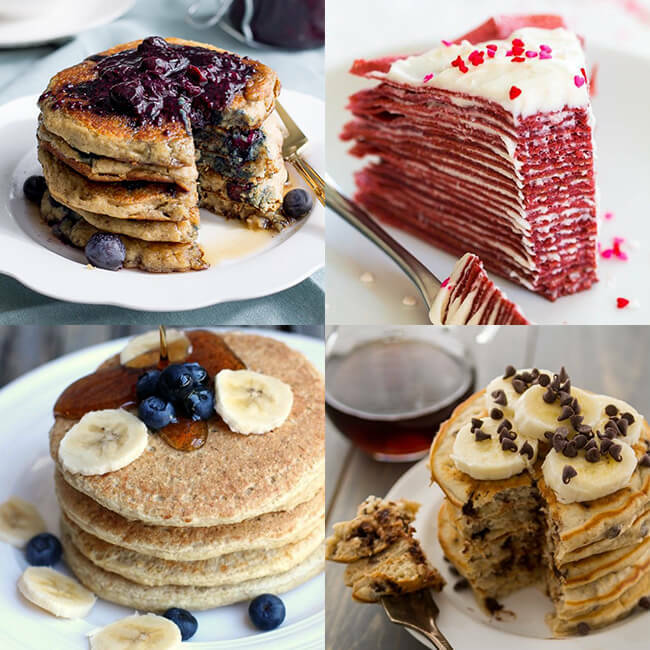 We've all seen that birthday cake stack of pancakes knocking about on Insta and Pinterest? Well these take the stacking to another level. You can either use a crepe style recipe like the classic above or you can use an American style pancake OR for another variation you can trial some healthier stacks. The possibilities are endless! First up, the oh so decadent Red Velvet Crepe Cake takes a little (OK, a lot) more effort than your standard pile of pancakes but if you're into the red stuff, it'll be worth it. I'm completely drawn in by these drool worthy Banana Chocolate Chip Pancakes which look surprisingly easy. All you do is mash two bananas into your batter recipe with a few added extras such as cinnamon and baking powder to make them puff up and go all lovely. Add your chocolate chips and get frying! 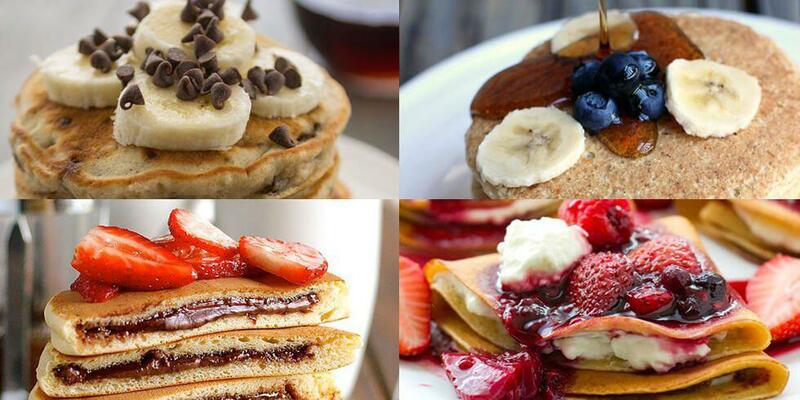 Trying to be good but don't want to miss out on all the pancake madness? These Healthy Oatmeal Protein Pancakes have the secret ingredient of cottage cheese which gives you a hit of extra protein to make you fuller for longer. Don't worry though, your beloved pancakes won't taste cheesey in the slightest and you can add whatever fruity toppings you like. Finally, these Blueberry Oatmeal Pancakes are vegan and gluten free. They're a little bit more complex than the above but perfect if you want to indulge in pancakes but you're vegan or gluten intolerant! So, instead of stacking pancakes, the other epic option is stuffing pancakes! 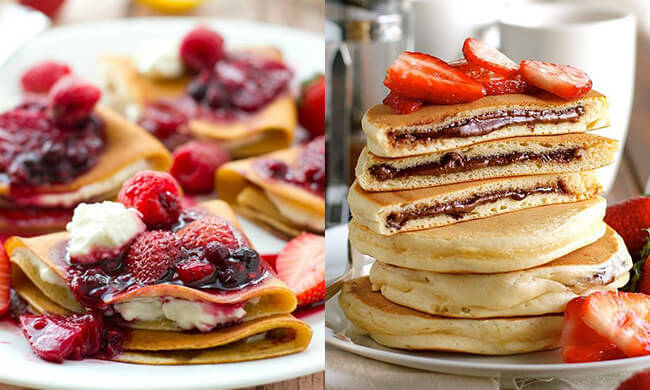 This works with both the crepe style with these amazing Mixed Berry Cream Cheese Crepes and with the American style with these ridiculous Nutella Stuffed Pancakes. For these little chocolatey disks of Heaven you just need your usual pancake batter and make a thicker dollop into the pan, wait for that to cook a little, add as much Nutella as you can handle then pop another dollop of batter on top, flip and cook all the way through!